Case Pyhä – most engaged Instagram picture from Finland this year? In winter 2016 I conducted a social media marketing campaign for the Finnish ski resort Pyhä. Beside the campaign I made a post in Instagram (not related to the campaign itself). Nevertheless, it became one of the highlights of the trip. The picture went viral in Instagram: Over hundred featured re-posts with a massive 45 million follower base in total. Features include many of the biggest travel channels i.e @bestavacations, @awesome.earth, @earthfocus, @luxuryworldtraveler and @beautifulhotels. In total the posts got 1 071 287 likes and 17 699 comments (updated on Jan 15th). 45 million follower base is used to estimate the impressions. Impression means that a real user has seen the picture. Value is measured with CPM (Cost Per Mille, meaning cost per thousand impressions). 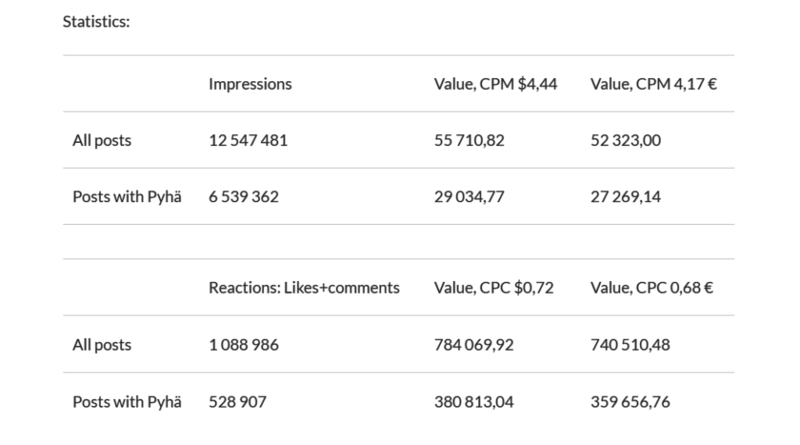 Likes and comments are reactions, measured with CPC (Cost Per Click). According to Brandwatch, 8% of all users are fake or bots. This affects the assumed amount of impressions. In order to deduct bots, the original amount of followers needs to be multiplied with 0,92 (hence reducing 8% bots). According to Hubspot, people miss on average 70% of their Instagram feeds. This also affects the assumed amount of impressions. In order to deduct missed posts, the original amount of followers (minus bots) needs to be multiplied with 0,3 (hence reducing 70% missed posts). All reactions are assumed to be real, not bots. Of course all of them are not real, but the exact ratios are unknown so let’s keep it simple. Calculations include the original post and 126 featured re-posts that can be found on my profile. Calculation exclude all the posts that I wasn’t tagged in, because they are hard to be found. Out of all posts, Pyhä was mentioned in 52 posts. To measure the value in money, I refer to the 2016 Salesforce Advertising Index and 2016 AdEspresso statistics: Instagram CPM $4,44 (4,17 €) and CPC $0,72 (0,68€). It is very difficult to estimate the value of an Instagram post. There are no reference studies available, and the situation is changing constantly. Still, metrics that was used in this case study prove that influencer marketing can be super efficient. The amount of money that Pyhä should have used to buy the same visibility is massive. Even the engagement rate is way higher that the numbers seen in other sites! Whether any of the users will ever travel to Pyhä – I don’t know. The post keeps on living and new features come all the time, so congratulations Pyhä and Finland! It might also be the most engaged Instagram picture from Finland this year! Note to any company with an Instagram strategy: This study demonstrates the power of influencer marketing and encourages companies to co-operate with content producers and social media persons. This post was originally published on Joonas Linkola’s blog.